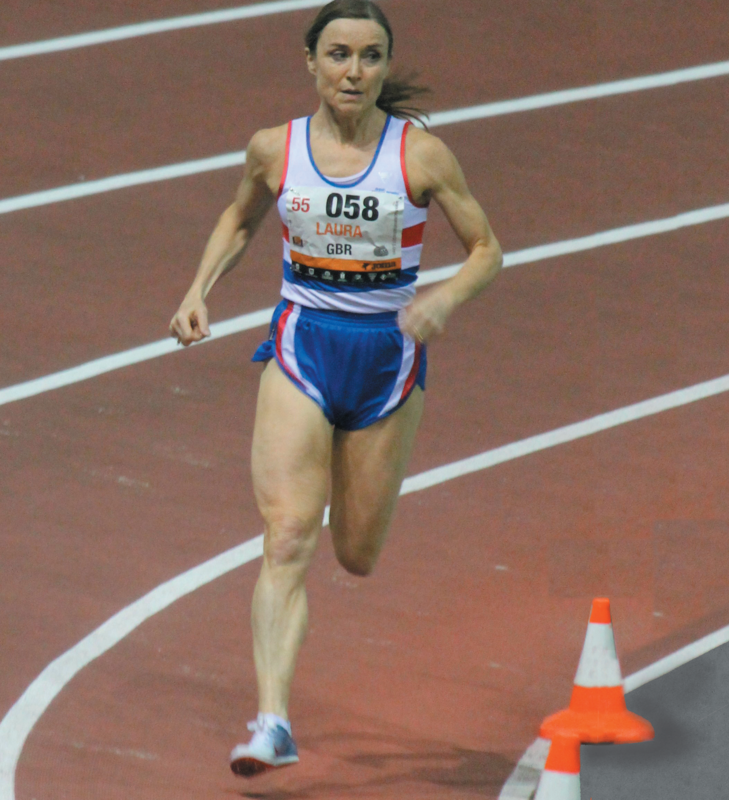 Laura Mahady at the 2013 European Veteran Indoor Athletic Championships in San Sebastian. She won the W55 800m in 2.27.84, bettering the world record 2.29.66 she set when winning the BMAF Indoor title at Lee Valley less than a fortnight earlier. Laura was also 2013 W55 World 800m and BMAF 800m and 400m Champion Outdoors. 4. Can you list your PBs? I have always enjoyed running, and ran daily for years just for the feel good factor it gave me. I began running competitively in 1996. 6. How did you get involved with your club? In 1998 my children and I took part in a local race, I was first lady, and my children were first, second and third respectively in the children’s race. We were approached by a member of AAAC and asked if we would consider joining the club. A few weeks later we joined the club. 7. What do you feel you get out of the sport? I get so very much out of the sport: there is the feel good factor which comes with running; I love a challenge; I enjoy the training; athletics has given me a social life with like minded people; it is something my son and I do together – we are in the same training squad; there are the achievements and the sense of fulfilment; athletics has become part of my identity; it has changed my career and working life….10 years ago I moved from being a lecturer in Psychology, to being a lecturer in Sports Psychology. 8. What would you not have wanted to miss about being involved in the sport? I wanted to run competitively as a child, my parents were approached by members of Hawkhill Harriers but my mother blocked all suggestions that I start spending time training; she feared my school work would suffer. I always told myself I would do it some day. I would hate to have never have had the opportunity. 9. What has been your best / most satisfying performance? Finland 2009, World Masters Championships, W50 800m. I felt like I was taking on the world. I was so determined, but also rather fearful. My mantra was: ‘This is mine’. I would rather have died (but only once I got over that finish line first) than let anyone beat me. The first lap I was very controlled but when I heard the bell go I knew it was time to see what I could do. I clocked 2:19.5 and set a new European record. My first international event was the World Masters Indoors in 2008 in Clermont Ferrand. I felt completely overwhelmed by it all. I ran in the 3000m and the 1500m. I achieved bronze in the 3000m but ran 30 seconds slower than I had done just weeks earlier. 11. Can you give some details of your training? I do 9 sessions a week, three or four of these sessions are completed with coaches, Joyce and Ken. I do an easy recovery run on a Tuesday and a 9 to 10 mile off road run with friends on a Sunday. My other three sessions are spent in the gym on the machines and using weights. 12. Has any individual or group had a particular influence on your running or attitude to running? There are many people over the years who have inspired me; my father was a competitive sportsman until he was 64 so I have never seen age as an obstacle. Several years ago at a Scottish Masters Championship I witnessed a jaw dropping performance by Esther Linaker. I was told that day that she was the fastest woman in the world in her age group. I thought that was the most amazing achievement, and it was something I immediately aspired to, but never thought I could achieve. My coaches, Joyce and Ken Hogg, have made me the athlete I am today, their dedication and hard work is reflected in our squad, and we are all very supportive of one another. 13. Do you have any running ambitions that are still unfulfilled? I just want to keep training, running and competing for as long as I can. 14. Are you or have you ever been involved in other sporting activities? I was THE sporty child at school: netball, gymnastics, hockey, athletics. I could never get enough. A few years ago I did some cycling and competed in a few duathlons. 15. You have run the Masters Cross Country International a few times, what are your memories of the event? The camaraderie amongst the team is great, you are running not only for yourself but for the team and for Scotland. Wearing that Scottish vest makes me feel proud. 16. What are your views on the administration of the sport in Scotland? I am always humbled by the efforts that everyone in the sport puts in. So many people giving of themselves in terms of time and resources. The outside world has little idea that the sport is run by volunteers. 17. Is there anything you would like to see from the SVHC that is not there at present? I would like to see more SVHC athletes encouraged to take part in these big international events. In particular, Scotland has produced some world record holding female masters athletes, eg Esther Linaker, Janette Stevenson, Fiona Matheson, Sandra Branney . It is unfortunate that some of these ladies have not attended these events and claimed their rightful place on the podium. 18. Tell us about your day job. I lecture in Sports Psychology at the University of Aberdeen. Filling this post came about as a direct consequence of being a Psychology lecturer who ran and competed. I have a real problem relaxing. Going for an easy run along the River Don with my dog is my idea of relaxation. Laura’s list of achievements in the sport is quite remarkable and it is maybe appropriate to list them in tabular form so that they can be appreciated – major records have been added at the end in red. * This record was broken twice! First at the British Indoors, then at the Europeans. When asked about her favourite races, Laura replies that the 800m in Finland in 2009 when she achieved her first world title and European record. Also rather special was the Aberdeen Sports Village Mile in 2009 when she ran on home soil and, with the support of family, friends and Aberdeen AAC clubmates, she won in a British record time. The European Indoors in San Sebastian, in 2013 is also memorable in that she achieved an age-group world 800m record the week before travelling to Spain with the result that she was so scared that someone would run faster in the European Championship that she went out really hard and kept running as hard as she could – and improved on her own world record! Given her talent and enthusiasm for the sport (and the 10 mile Sunday runs with runners of the calibre of Mike Murray, Peter Wilson and Peter Jennings, the table will need extending ere long.